What’s even stranger is that Congress signed off on phasing out this credit in its entirety in the 2018 tax bill. It’s an expensive write-off that mostly benefits the uber-wealthy, who buy electric cars as status symbols and tokens of environmental consciousness. None of that takes into account the resources expended to produce the electricity used to power these cars once they’re purchased, or the environmental problems associated with disposal of the batteries that power them once the vehicle has reached the end of its useful life. Under current law, the tax credit for electric vehicle purchases phases out for each type of electric vehicle once its manufacturer has produced 200,000 units. As of October 2018, only Tesla had made that many EVs. General Motors was second at 196,000, and may hit the mark before the plant that manufactures its electric car is shut down. Ford, Toyota, and Nissan, the other companies in the all-electric business, have a long way to go. It’s clear from the numbers that market demand for these cars is pretty slow. It might have been higher back when a gallon of regular gas cost more than $4, but back then the technology never matched the hype. This controversy over the electric car credit gives the retiring Sen. Orrin Hatch, R-Utah, currently chairman of the Senate Finance Committee, one more chance to be a hero. If he steps up to the plate by insisting the credit expire as scheduled, that would be bold. Bolder still would be to demand its elimination now in order to pay for further tax relief. About half the EVs sold, says the International Council on Clean Transportation, are purchased in California, where the credit helps take the sting out of the high taxes paid by those in the nation’s most liberal state, including the gas tax. 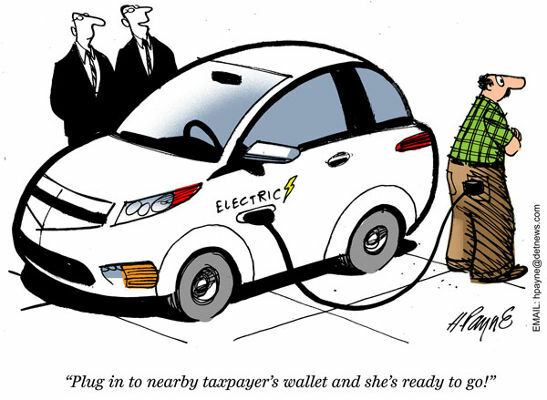 The EV credit is a federal sop that helps outgoing Gov. Jerry Brown (and will help incoming Gov. Gavin Newsom) tax, spend, and regulate without accountability. It’s time to look seriously at getting rid of subsidies for products that are otherwise not in high demand. If we can’t do that, then we will never, ever get the budget behemoth under control. The Senate, led by Hatch and Majority Leader Mitch McConnell, R-Ky., should say, “No,” loudly and clearly, to any extension of the existing credit. In fact, they should be leading the charge to end it now, not in 2022 or when the 200,001st Nissan Leaf rolls off the assembly line. They’ll be heroes to the taxpayers if they do it. It will be one last accomplishment to make Hatch proud as he closes out his long and distinguished career.